Rapture Fashions is a really cute line of clothing, jewelry, and handbags. I was sent these cute "spicy" earrings which retail for only $7. I love them! They seem like great quality and look very nice on. Everything that the company sells is very affordable which is hard to find nowadays. For example, some of the cute dresses are only $20 online! Also, the items are very stylish and great for younger women. I am excited to have found this brand! The giveaway will be for 5 $5 gift certificates to 5 lucky readers! The giveaway is open until Midnight on Friday November 12th. Winner will be chosen on Saturday November 13th using Random.org. 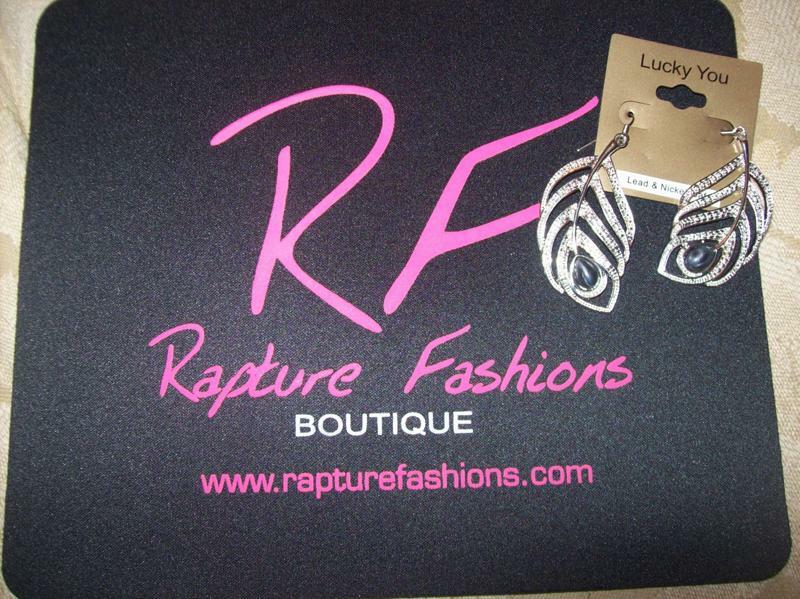 Visit the Rapture Fashions website and let me know what your favorite item is! I <3 the entrancing ring! I like the Adore dress. I'd love to see some cookbook reviews on your blog. I entered the BonitaJ giveaway! following your blog via Google connect! i entered the downeast basics giveaway! i really love the emotion handbag! in the market for a new work bag - this would be perfect! keep up the giveaways though!